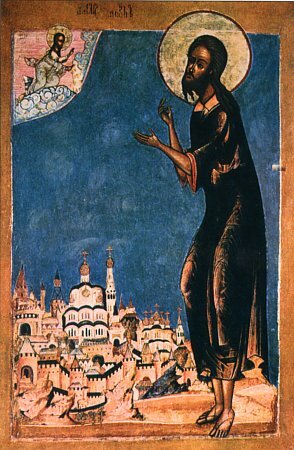 Saint Alexis dwelt in Edessa for seventeen years. Once, the Mother of God spoke to the sacristan of the church where the saint lived: “Lead into My church that Man of God, worthy of the Kingdom of Heaven. His prayer rises up to God like fragrant incense, and the Holy Spirit rests upon him.” The sacristan began to search for such a man, but was not able to find him for a long time. Then he prayed to the Most Holy Theotokos, beseeching Her to clear up his confusion. Again a voice from the icon proclaimed that the Man of God was the beggar who sat in the church portico. The sacristan found Saint Alexis and brought him into the church. Many recognized him and began to praise him. The saint secretly boarded a ship bound for Cilicia, intending to visit the church of Saint Paul in Tarsus. But God ordained otherwise. A storm took the ship far to the West and it reached the coast of Italy. The saint journeyed to Rome and decided to live in his own house. Unrecognized, he humbly asked his father’s permission to settle in some corner of his courtyard. Euphemianus settled Alexis in a specially constructed cell and gave orders to feed him from his table. Living at his parental home, the saint continued to fast and he spent day and night at prayer. He humbly endured insults and jeering from the servants of his father. The cell of Alexis was opposite his wife’s windows, and the ascetic suffered grievously when he heard her weeping. Only his immeasurable love for God helped the saint endure this torment. Saint Alexis dwelt at the house of his parents for seventeen years and the Lord revealed to him the day of his death. Then the saint, taking paper and ink, wrote certain things that only his wife and parents would know. He also asked them to forgive him for the pain he had caused them. After Liturgy the Voice was heard again in the temple: “Seek the Man of God in the house of Euphemianus.” All hastened there, but the saint was already dead. His face shone like the face of an angel, and his hand clasped the paper, and they were unable to take it. They placed the saint’s body on a cot, covered with costly coverings. The Pope and the Emperor bent their knees and turned to the saint, as to one yet alive, asking him to open his hand. And the saint heard their prayer. When the letter was read, the righteous one’s wife and parents tearfully venerated his holy relics. You budded from a famous and glorious root; / You blossomed from a royal and illustrious city, O supremely wise Alexis; / You disdained everything on earth as corruptible and fleeting, / And you hastened to Christ the Master. / Always entreat Him to save our souls. Today with hymns and praise / We celebrate the feast of Alexis the blessed and we cry aloud: / Rejoice, gladsome adornment of the righteous.